Scitec Instruments offers the VISUALIZETM family of laser alignment detection products from Applied Scintillation Technologies. These products are designed for viewing the beam during profile measurements and component alignment. 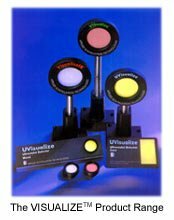 The VISUALIZETM range of laser alignment phosphor products provide optimum performance and safety for laser users, engineers and scientists. UVisualize is part of the VISUALIZETM family of laser alignment detection products designed for viewing the beam during beam profile measurements and component alignment.